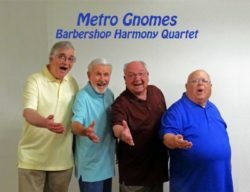 The Saratoga Historical Foundation is hosting the Metro Gnomes barbershop quartet on March 26. The Metro Gnomes will take you on a journey through the world of close harmony to explain and demonstrate this art form, with wax-cylinder sound recordings, videos, and live performances. Learn how barbershop quartets helped to sell early phonographs, and of the nationwide radio broadcast of the 1939 New York barbershop singing contest. Hear how, through careful blending, four voices can sound like many times that number. The lecture will begin at 7:30 PM and take place at the Saratoga Foothill Club located at 20399 Park Place in Saratoga. The lecture is free for Saratoga Historical Foundation members and $5.00 for nonmembers. For more information go up to www.saratogahistory.com or call 408-867-4311—no reservation needed.